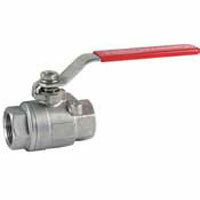 Ball Valves are quarter-turn ball valves available in manual, electric, or pneumatic actuators. The materials they are made from include brass, stainless steel, and plastic models. Applications include heating systems, water treatment, and gas or liquid flow control. 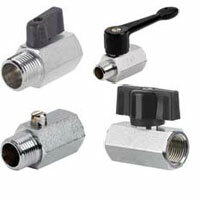 Ball valves are available in a wide variety of sizes for versatile application. Quarter-turn ball valves available with electric or pneumatic actuators. Some models are full ports, others are cavity filled, and some are V-Ball. Applications include heating systems, water treatment, gas or liquid flow control. Certain models are equipped with manual overrides allowing the operator to cycle the valve manually. Quarter-turn ball valves available with manual hand lever actuators. Brass, stainless steel, and plastic models. Models are economical and compact. Available in a wide variety of sizes for versatile application. Copyright © Dwyer Instruments, Inc. All Rights Reserved.